Bali is famous for some of the best scuba diving in the world and reefs along Nusa Lembongan and Nusa Penida are the jewel in the crown. Bali is famous for great family holidays, beautiful weddings and would you believe it- World Class Scuba Diving. Bali, and more importantly, Nusa Lembongan diving is some of the best and most exhilarating diving you can find. 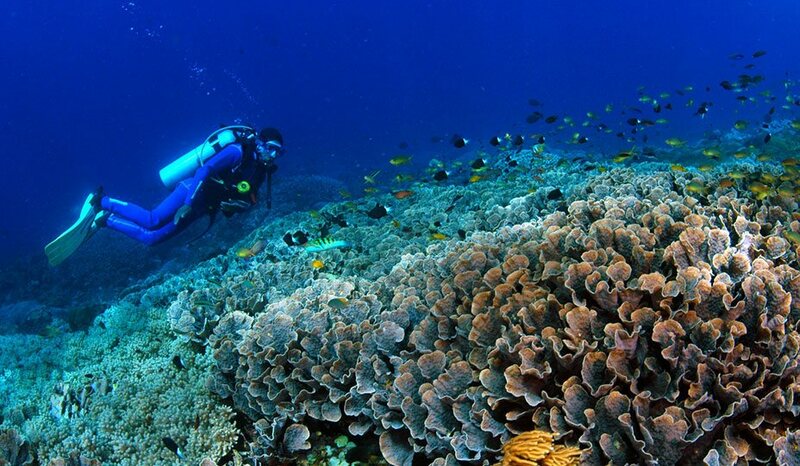 The Nusa Lembongan and Nusa Penida region is home to a variety of great dive sites. Certified divers will have heard of places like Crystal Bay and Manta point that are home to some incredible marine life like Mola Mola’s (Oceanic Sunfish) and huge oceanic Manta rays. The reefs around neighboring Nusa Penida are in beautiful condition and offer exhilarating drift dives along pristine coral walls. 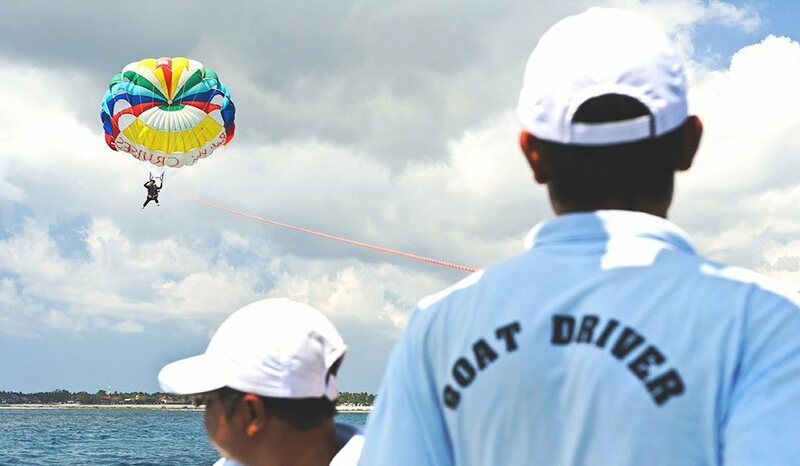 We are very lucky at Bali Hai Cruises to have our own international dive center – Bali Hai Diving Adventures. As a family orientated cruise Bali Hai diving offers you and your family the chance to try scuba diving for the very first time with our specialized PADI Discover Scuba Diving program. Not a certified diver yet? We can offer you and your family the chance to try scuba diving for the very first time with our specialized PADI Discover Scuba Diving program. You get the chance to dive Nusa Lembongan bay with our team of PADI scuba diving professionals as they guide you through the basics. 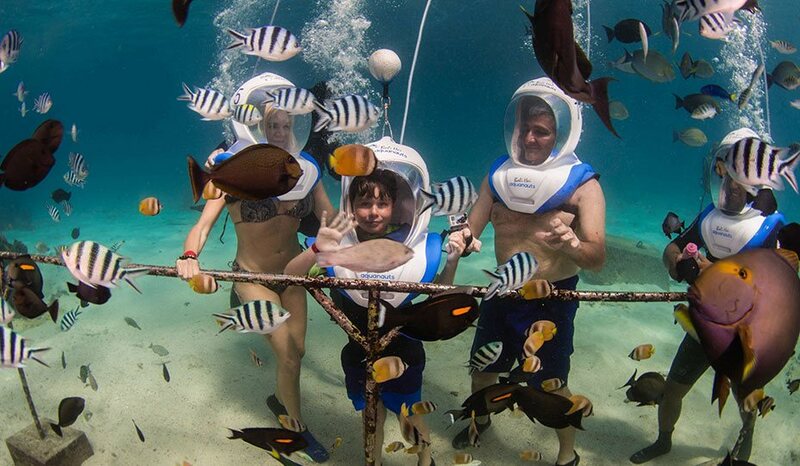 This is a great way to try scuba in a really safe yet beautiful environment. Are you a certified diver? No doubt you will already have have heard of places like Crystal Bay and Manta Point that are home to incredible marine life like Mola Mola (Oceanic Sunfish) and huge oceanic Manta Rays. The reefs around neighbouring Nusa Penida are in beautiful condition and offer exhilarating drift dives along pristine coral walls. Check out our Diving page which describes all of our dives in more detail. 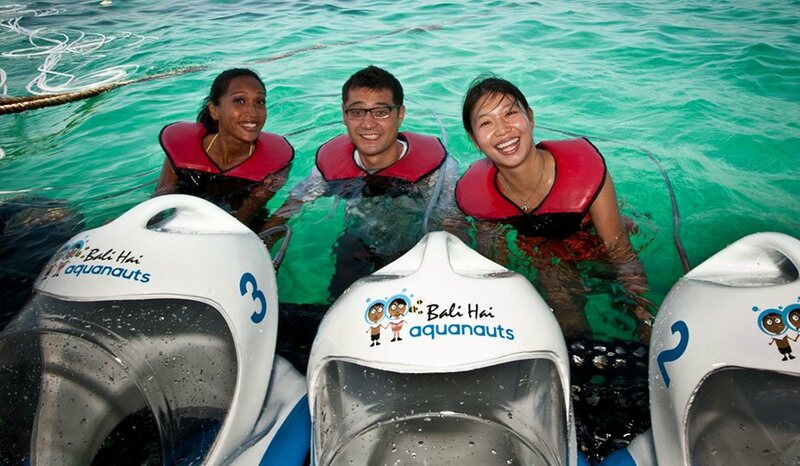 Bali Hai Diving Adventures runs a range of PADI dive courses. 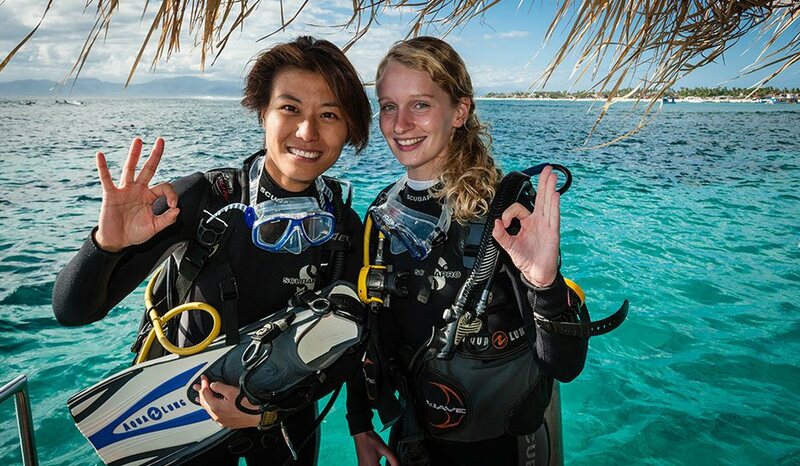 Courses must be booked in advance so please contact us for more information about our PADI Dive Courses. Check out our Diving page which describes all of our courses in more detail. Nusa Penida and Nusa Lembongan are well known for their world class dive sites. 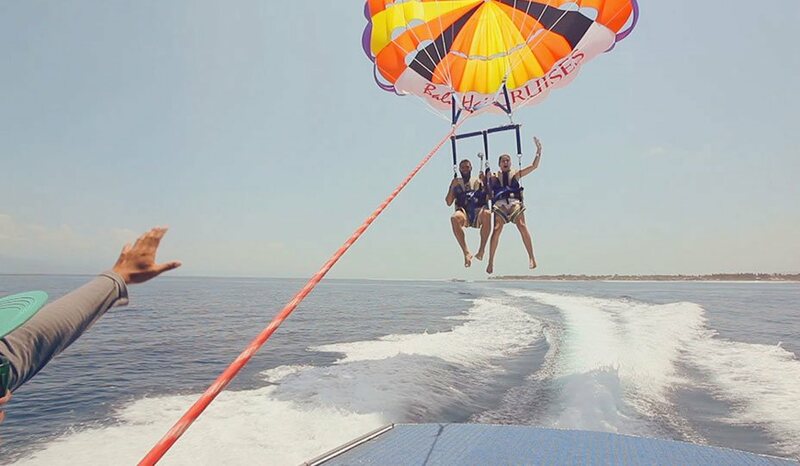 If you are a certified diver then you may be able to join us for some exceptional adrenaline dives. At certain times of year we have the Mola Mola around, which are incredible creatures. Bali is only one of a very few places worldwide where you can see them while scuba diving. Manta trips are available daily for certified divers and are also open to any of our scuba diving guests who are staying overnight in our resort on Lembongan Island. When staying overnight our Manta dive trips depart early morning so we can arrive before the boats from Bali, enjoy these amazing creatures without the crowds! 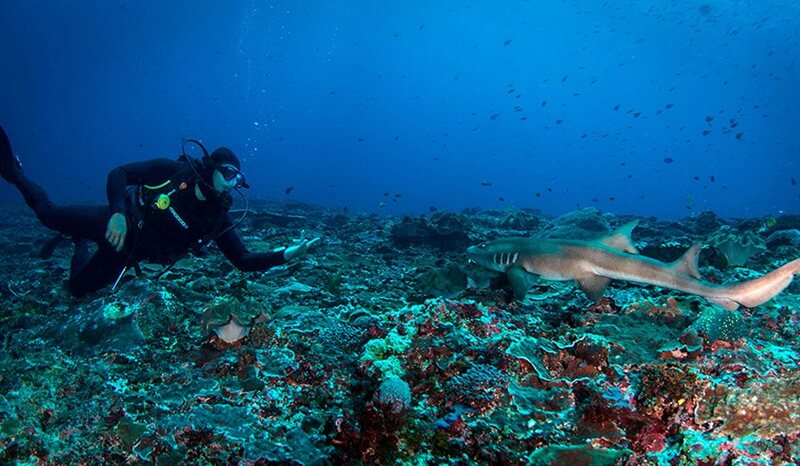 These graceful giants will be the highlight of your dive trip in Nusa Lembongan and Nusa Penida. Check out our Diving page which describes all of our dives and courses in more detail. 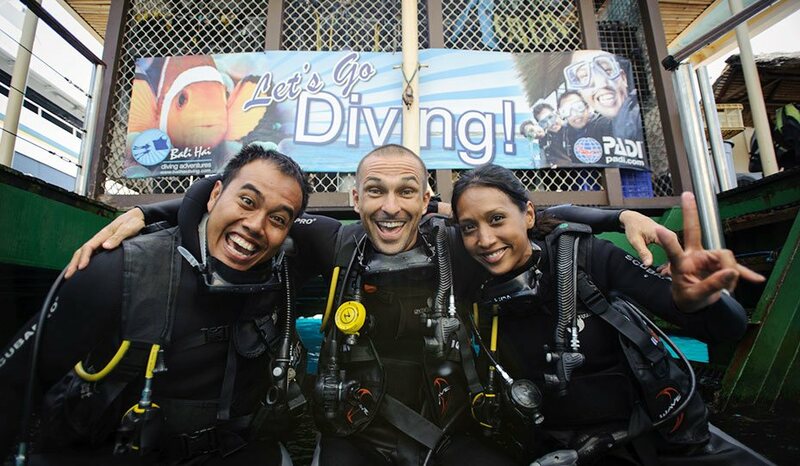 Certified Diving: USD 45 to 80 depending on the dive program. 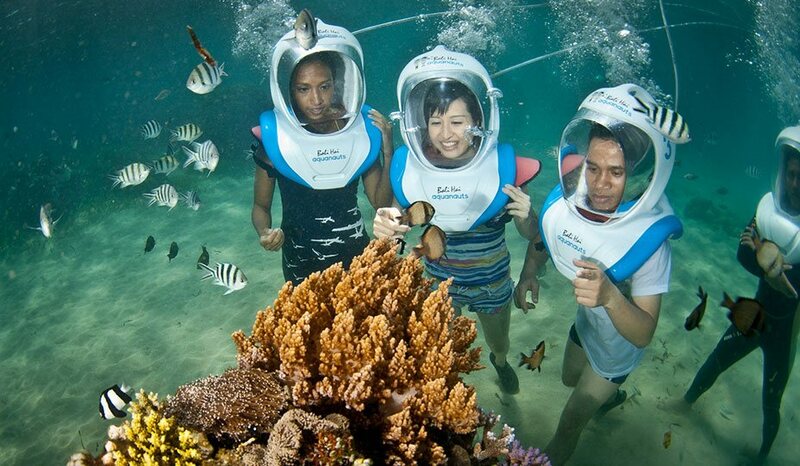 Aquanauts is an exciting underwater experience which uses our unique seawalker helmet to allow you to breathe underwater whilst walking amongst Lembongan’s vibrant tropical reefs and diverse marine life. 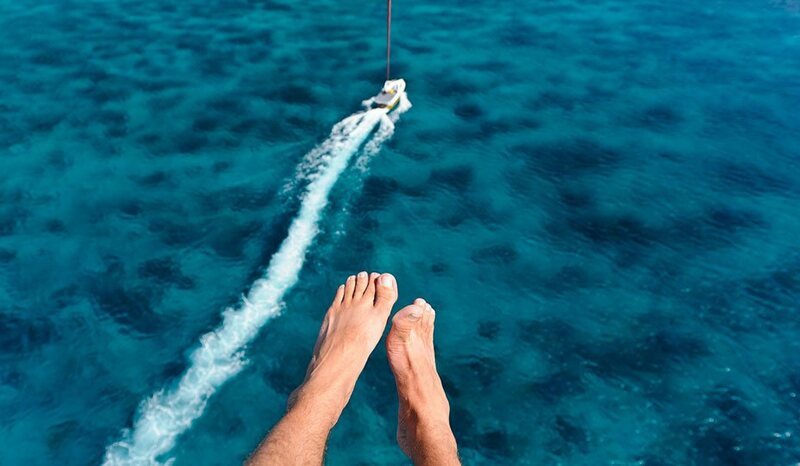 This activity takes place on a special platform adjacent to our exclusive pontoon. (*This is an optional activity and an additional charge applies.) We have vessels that will ferry you out to the pontoon and back as needed. The vessels operate from 10.45am to 3pm. Perfect for those who would love to experience the amazing underwater world for the very first time, and catch a glimpse of tropical fish and vibrant coral reef, just as you would when scuba diving or snorkeling but without even getting your face wet! 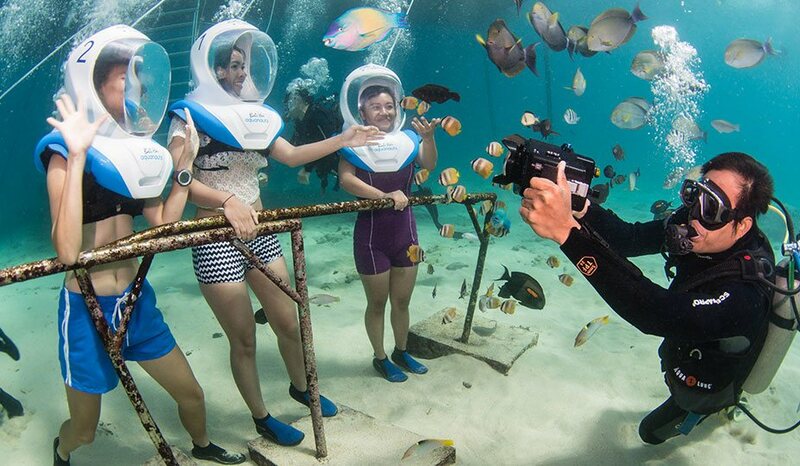 Aquanauts, allows everyone to immerse themselves into the marine world. It’s easy, fun and safe! Enjoy a full safety briefing (available in English, Indonesian, Japanese, Mandarin and Russian) and then let the adventure begin! 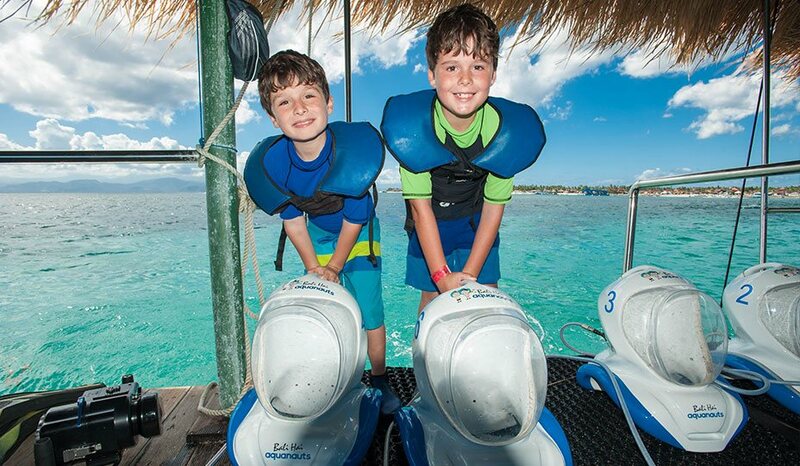 Once you slip into the water, our friendly team will help you put on your unique Seawalker helmet, which will keep your face completely dry! And no need to use any mouth piece! 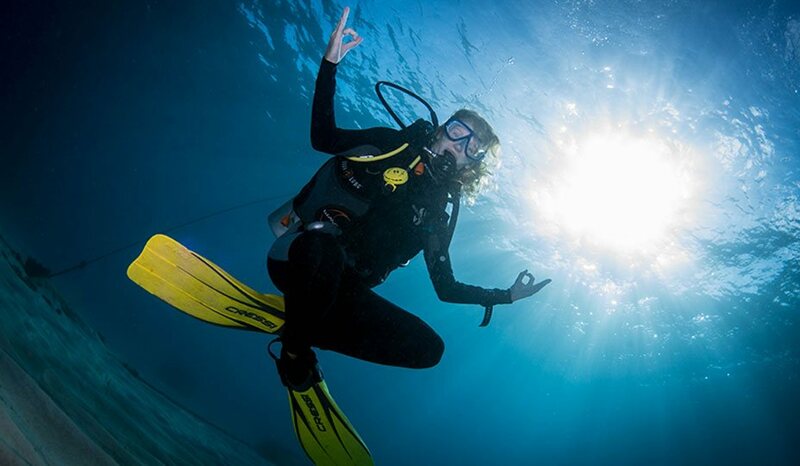 Under the supervision of your experienced Aquanauts guide, you will experience moon walking on the ocean floor while discovering a new world, just like Astronauts in space! Experience the colourful tropical fish and beautiful coral reef in the crystal clear waters surrounding Lembongan Island. Interact with colourful Clown Fish (Nemo), Butterfly Fish, Angel Fish, Surgeon Fish, Sergeant Major, Trumpet fish, Zebra fish and many more. 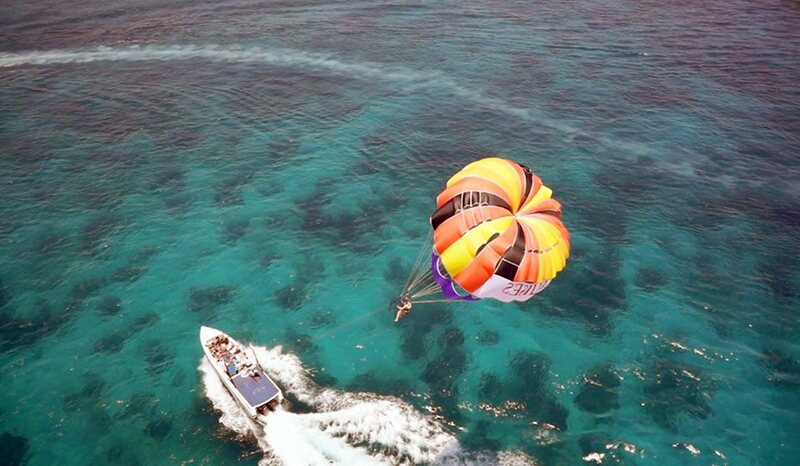 Fly high and get an amazing birds-eye view to Lembongan Bay. The view is incredible and the experience breath taking. 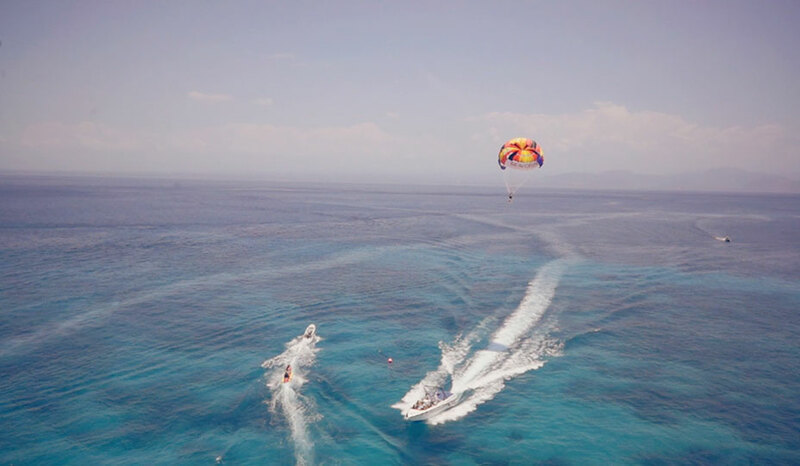 This is the way to see the beautiful mazes of coral reef formations around Lembongan island. With the aquamarine waters meeting the white sandy beaches, the palm trees swaying in the warm tropical breeze this makes for an unforgettable moment. Worth taking your pocket camera or your video recorder up with you to capture the magic. Make sure to use the wrist strap. The Balinese are famous for their inherited knowledge of the art of massage. Indulge yourself and relent to their magical touch. Place yourself in one of the traditional Balinese huts and indulge in a massage whilst enjoying the sound of waves breaking on the white sand of Mushroom beach. Complete a relaxing day in the beach resort, by restoring the balance and harmony of your mind and body with an incredible massage treatment, you will feel reborn and re-energized! Price varies depending on the service.